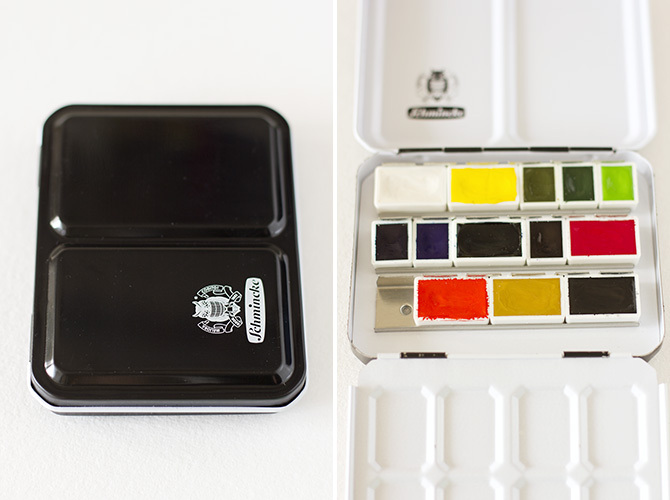 I received my tin of Schmincke Horadam watercolours. I chose a small, compact tin that holds 9 full pans. I replaced some of the full pans with half pans and currently there are 13 colours. I could fit up to 21 colours in there. I'm still a newbie when it comes to aquarelle. Finished my third picture last week, the corner of which can be seen here on the right. My first try was quite a mess though since being used to oils I kept using way too much paint and it looked pretty gruesome. 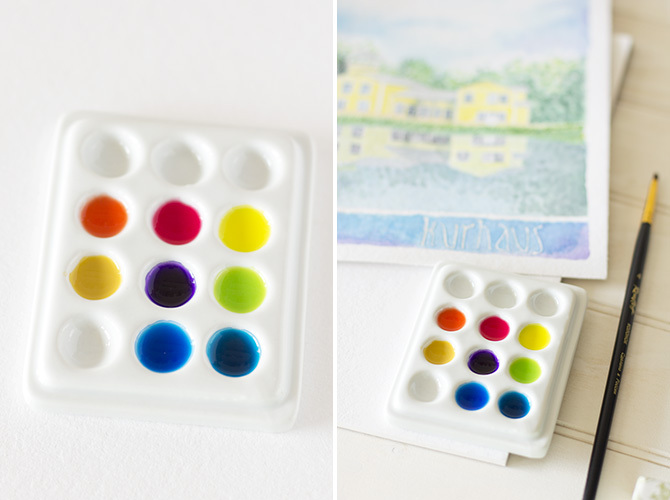 I find the advantage of watercolour is time, it takes virtually no time at all for the picture to dry and voilà! you may add another layer of paint. For very small details I wanted to add a tin of watercolour pencils to my arsenal and started searching for the best maker/brand. 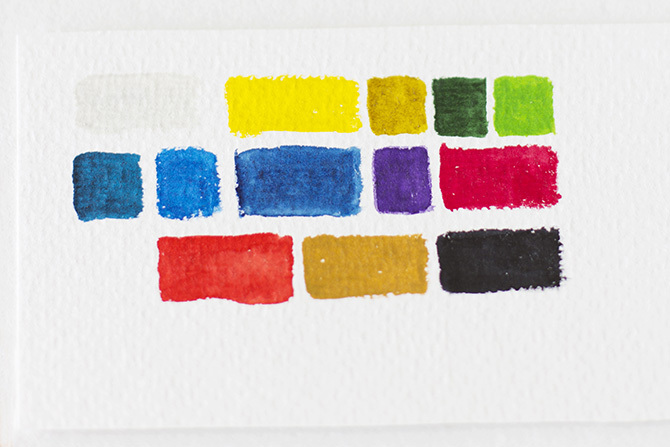 I was fascinated by the bright colours of Derwent Inktense pencils, until I came across some blog posts about its poor lightfastness, that is. I must admit I never thought about lightfastness before since previously I had only used oil paints and assumed straight off that oils are lightfast. Not always true! Yeah, that was really surprising. Some oil pigments really do fade away, too. Naturally I was really relieved to learn that Schmincke watercolours which I had just received did pretty well in the lighfastness test. But to be on the safe side I am conducting my own test. I took an A5 sheet of Hahnemühle Cornwall watercolour paper, cut it in half and painted both sides identically. I taped one of them to a south facing window and hid the other one in the back of a drawer. I painted the colours in the same order as they lie in the tin. I'll be checking them after three months and six months. Most of my watercolours have a four or five star lightfastness rating but there are a couple tones with lower ratings as well. Interesting to see how it all turns out! Back to the pencil hunt. I browsed through the websites of all known pencil manufacturers, Derwent, Faber Castell, Caran d'Ache, Schwan Stabilo, Staedtler. Most of them do have charts and tables on their sites with lightfastness ratings but they all have their own system so it's hard to tell really. Caran d'Ache Museum watercolour leads have caught my eye but they seem a bit finicky and a bit on the pricey side as well. So I haven't actually bought any watercolour pencils yet. Any recommendations? I am at a loss since I don't want my drawings to fade into oblivion after a couple of years. There are plenty examples around the blogosphere of drawings and sketchbooks that are only a few years old yet half the colours have faded into dull greys. Selle sildiga postitusi hakkan nüüd küll põnevusega jälgima, ise olen ka viimasel ajal vesivärvimaastikul uuesti kobama hakanud. Meil on suht tutikas kingiks saadud karp neid Peterburi värve ja mässerdan nendega. Kui karp tühi ja esimesed 100 000 akvarelli valmis, siis ostan kallima karbi:D Kust sa muidu enda värvid ostsid? Alguses ma ostsin ühe suva Winsor & Newtoni metallkarbi, selline õpilastele mõeldud variant, aga üsna korralik. Sain sellega kaks esimest pilti tehtud ja kui tahtsin järgmise kallale asuda, siis polnud värve enam kuskil. Tundus, et sattusid kapikoristuse tuhinas prahi hulka? Ei tea, aga siis tundsin, et jah akvarell istub mulle küll ja hakkasin otsima karpi mis oleks jääv. Kõik Schmincke reitingud ja arvustused olid head ja kuidagi ma nende peale juhtusin. Tellisin internetist, ühest inglise veebipoest. Mul on üks hädaabikarp venelaste White Nightsi ka (ostetud siis kui Winsori karp kaduma läks), aga toonid seal ei ole nii minu meele järgi.